Welcome to Day 7 of the My Creative Time 12 Days of Christmas! I hope you are having a fabulous week! Im so excited to say that Im almost done with my Christmas shopping! Whoop! I love shopping but this is the one time of the year when it's not fun for me. I love making my family happy but it sure is a lot of work! In the end it's all worth it. Have you checked out all the awesome projects so far?? I knew our team was talented but WOW I am truly blown away! If you haven't followed along, start at Day #1. For my project, I made this quick and easy card. Remember, I am not a card maker, so I consider myself a rookie! Mini albums, layouts and smash pages come easy to me. Cards..well thats another story..Anyways, I used the Its a Magical Season for this simple but sweet card. I told you it was simple..And did you notice the crazy stitching?? I did it on purpose..(yea right lol) I stamped the snowman directly on the paper then added another layer. I popped him up on foam dots. Thank you for stopping by today! Don't forget to check out the rest of the team and comment for a chance to win! Take care and good luck! Hugs to you all! What an adorable card you outdid yourself on this one and I love your dancing stitching after all isn't Frosty dancing to his tune ....the music is "Frosty the Snowman" right!! Well this is my dream and I'm stickin' to it!! HI Very nice card. Keep up the good job you are doing. What a very sweet card. I love his hat...stickles are one of my favorite go to items! Thanks for sharing. slbuller at fullchannel dot net. Very pretty card!! Love this saying!! 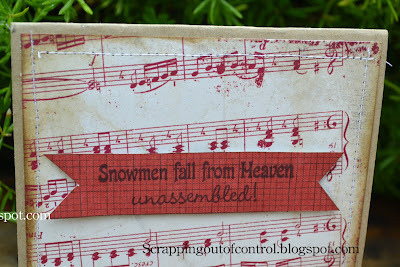 Wow, for someone who finds card-making a challenge, you have rocked it with this one - absolutely adorable!! You've showcased Emma's products wonderfully! Thank you for sharing; thank you for starting my day off with a smile! What a sweet card, Nancy! I love the paper you used, and the sewing and sparkly snowman hat are the perfect touches!!! Your card is adorable!! I love the papers you used! You do a great job on cards. This one is simply adorable! TFS! You did a great job on your card, it's adorable!! Very nice Card. Perfect papers. This is one of my favorite sets. Pretty music background. So pretty...love that music paper! Very cute card--I like the music background and the glittery hat. what a sweet card! I love the adorable snowman and all the glitter you added to his hat! You did a great job! 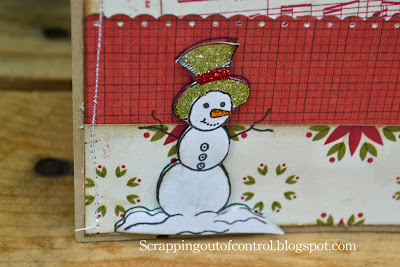 I love how you stamped the snowman and then stamped and pop dotted him! Great idea! Such a cute little snowman and like the musical paper too. Love the card. I think the music paper is great. Really cute card, love the music paper. Almost bought a stamp that was music paper today. Didn't notice the crazy stitching until you said so :D Your blog background is too cute also. 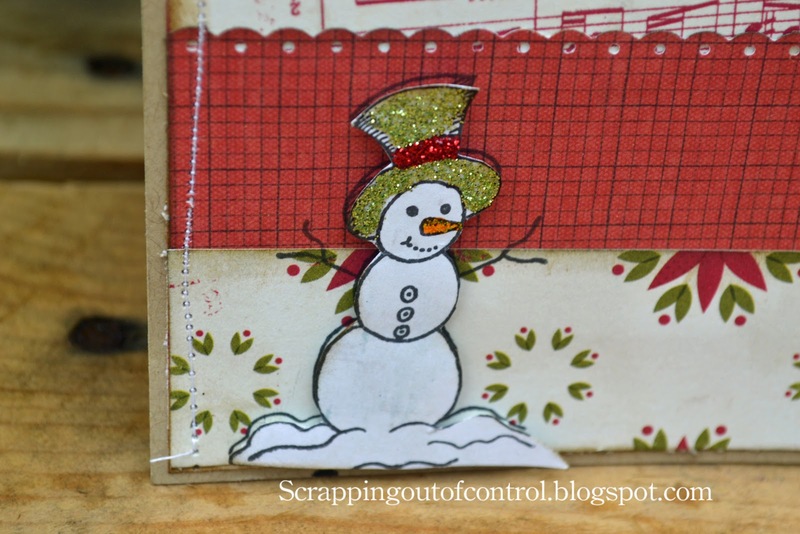 I like how you stamped and pop up the snowman. Love his hat. You did great on your card. Your card is so pretty and I love your snowman's hat! Love the snowman! TFS your card with all of us. Very cute! I really like this little snowman. The sentiment is very cute! It's true! They DO fall from heaven unassembled. Sweet card with cute snowman. I love the sentiment. Nancy ~ Oh this is so ELGAND T looking! The papers and the design is just PERFECT! I LOVE that you sewed this too! That little snoman is the PERFECT touch too! BEAUTIFUL card! 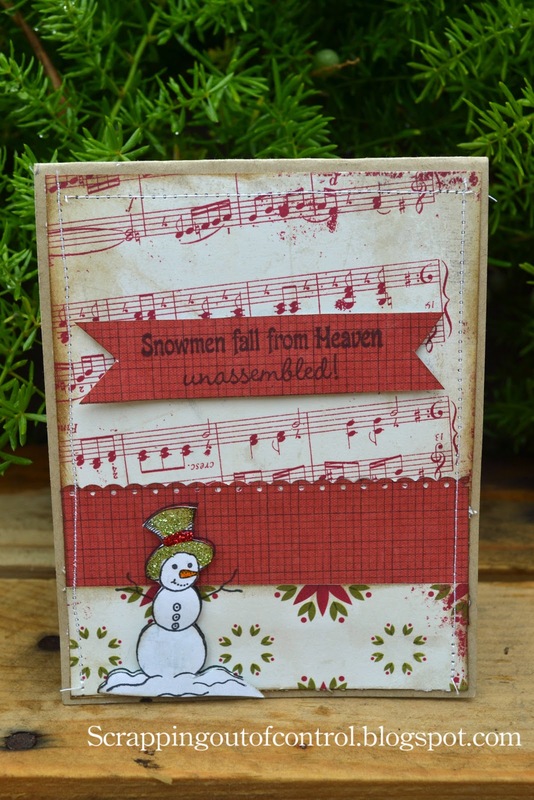 Beautiful card, I really like that little snowman, thanks for sharing. Super cute card. Love this little snowman. Adorable card! LOVE your papers!!! Thank you for sharing your cute card. TFS. Oh my goodness what an adorable card. Love the sheet music w/ the snowman perfect.